The objective of the Upstate Branch is the advancement of the profession of civil engineering in a manner consistent with the objectives of the American Society of Civil Engineering as selected by the branch members. The Branch typically seeks to meet its objective by offering low cost/high value PDH opportunities and continuing education to its members, providing networking and community outreach opportunities, and by engaging youth in civil engineering through pre-college outreach. Once you've signed up there you will be a member of our branch. Now head to one of our monthly meetings! Questions? Contact our Secretary at ASCEUpstate@gmail.com. 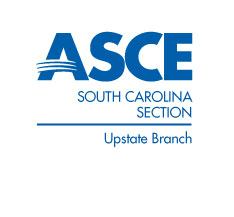 Below is the ASCE Upstate Branch Operating Manual. There is useful information on the day-to-day operation of the branch as well as roles and responsibilities for each officer.